An examination by the Giffords Law Center to Prevent Gun Violence found that of the dozens of gun safety bills passed in 2018, 67 measures would have an impact on gun-related deaths and injuries. An examination by the Giffords Law Center to Prevent Gun Violence found that of the dozens of gun safety bills passed in 2018, 67 measures enacted in 26 states and Washington, D.C. would have an impact on gun-related deaths and injuries. Click on one of the red or blue colored states for more. After a gunman killed 17 students and adults last year at Marjory Stoneman Douglas High School in Florida, young survivors declared #NeverAgain and demanded action on gun control legislation. 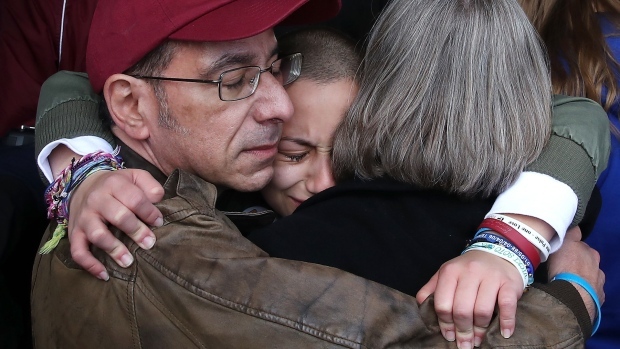 With support the of their peers, parents, advocates and celebrities, they rallied at statehouses across the country, called out lawmakers by name and marched for their lives, applying unwavering pressure on elected leaders to enact stronger gun control laws. 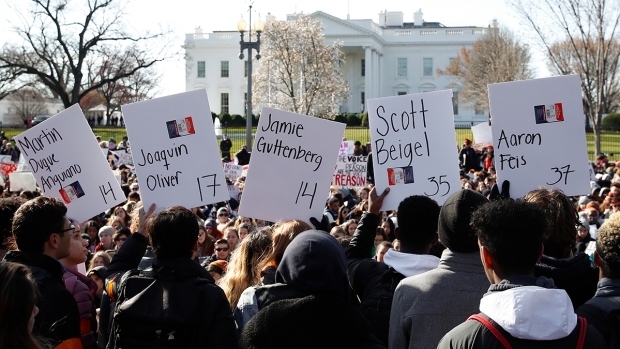 Hear some of the most emotional moments from student speeches at the Washington, D.C., March for Our Lives rally on March 24. In the months following the Valentine’s Day massacre in Parkland, lawmakers at the state level passed a slew of gun control measures ranging from increasing criminal penalties for gun-related crimes to banning lethal accessories like bump stocks, according to the gun control advocacy group co-founded by former U.S. Rep. Gabrielle Giffords, the Arizona Democrat who survived a 2011 shooting. An examination by the Giffords Law Center to Prevent Gun Violence found that of the dozens of gun safety bills passed in 2018, 67 measures enacted in 26 states and Washington, D.C., would have an impact on gun-related deaths and injuries. Among those are raising the minimum age to buy guns, keeping guns out of the hands of domestic abusers, expanding background checks and "red flag" laws allowing law enforcement to take away guns from people deemed at-risk. Many of these passed in states dominated by Republicans. The GOP-controlled legislature in Florida passed a gun safety reform package with the support of its Republican governor that expanded background checks and added a waiting period for firearm purchases, among other changes. The move was atypical for a state with a history of "recklessly weak gun laws," the Giffords Center noted. Still, gun advocates made gains in weakening or expanding laws in some states. Idaho and Wyoming passed Stand Your Ground legislation, the controversial law removing the duty to retreat from a conflict before using deadly force. South Dakota and Wyoming approved bills allowing firearms in houses of worship, while West Virginia passed a law that forces private business owners to allow guns in their parking lots. Other enacted measures ranged from lowering the age for a concealed carry permit to allowing firearms on the grounds of private schools and expanding the ability of a person to subjecting all gun laws to the strictest form of judicial review, as was done in Iowa.